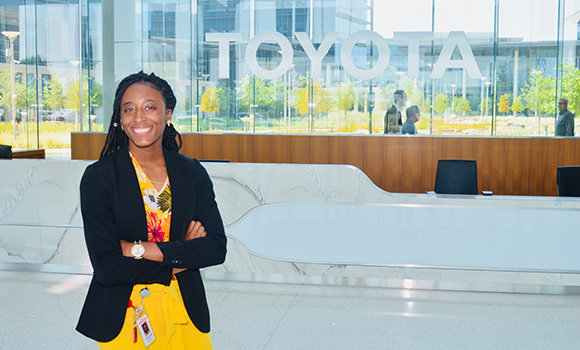 This summer, UNCG student Carlena Neely is working at Toyota's North American Headquarters in Plano, Texas, as part of the 2018 NASCAR Diversity Internship Program. UNC Greensboro sophomore Carlena Neely is one of 34 students from across the nation to participate in the 2018 NASCAR Diversity Internship Program. The 10-week, paid summer internship offers students from diverse backgrounds a unique, hands-on experience in the motorsports industry, working with NASCAR and its partners. Neely, an information systems and supply chain management major in the Bryan School of Business and Economics and Lloyd International Honors College student, is currently working at Toyota’s North American headquarters in Plano, Texas. As part of the marketing analytics team, she uses business intelligence tools to analyze data, and then uses those insights to help develop new marketing strategies and reach new customers. Neely has a passion for technology and entrepreneurship, which is why she ended up at UNCG. The information systems concentration – a program that teaches computer programming, systems development, network management and website development, among other technical skills – is the perfect blend of her professional interests. Now Neely has the opportunity to put those passions to use, as well as broaden her technical skills and network with other professionals in the field. But it’s not just about professional growth – the internship has helped her mature as a young adult.